Saturn Planet is considered to be a malefic and it takes 29 years 10 months to go through a full cycle of the Zodiac; divided in 12 signs of 30⁰ each, so it remains in one Sign for about two and half years in one Sign. The transit period of Saturn through starting from 12th then 1st and finally 2nd House from Natal Moon is known as Sadhe-Sati period and is of 7ⁱ⁄₂ years and 20 days. The 2 ½ years transiting period of Saturn through one Sign is also known as Dhaiya. It is believed that Sadhe Sati period is in one’s life is a period is inauspicious full of problems and sorrows in other words period of torture by Saturn planet; but it is practically observed and seen it is a myth but it’s not so. 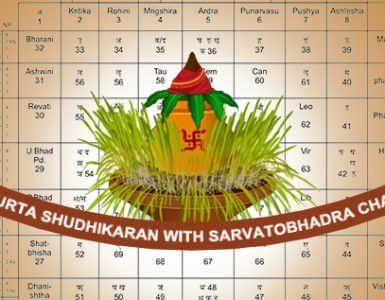 According to classical texts this period gives its results depending on Saturn’s position in Lagan Kundali, Natal Moon chart, Nakshatras, and placements of Signs and other Planets in different Houses (Bhavs), depending upon positions of other factors. Finally one must keep in mind that Saturn is a planet of discipline; it does justice depending upon your Karmas. If one is disciplined and go by the laws of nature – need not to worry much. On 26th January, 2017 (Thursday) at 21:34 in Chandigarh – Saturn is leaving Scorpio-8th Sign and entering Sagittarius-9th Sign. For Natives having Natal Moon in Capricon-10th Sign will be starting of Sadhe-Sati period of Saturn. Phase 1. – First 3 months and 10 days : Period of losses. Phase 2. – next 1 year 1 month and 10 days : one can control most of the problems provided one is disciplined, follow laws of nature and of truth. Phase 3. – Next 1 year and 8 months : period of changes, alterations, removals and travels. Phase 4. – Next 1 year and 4 months : gives comforts and increase of wealth. Phase 5. – Next 1year 1month and 10 days : period of sorrows and troubles. Phase 6. – Next 10 months : period of gains in all fields of life. Phase 7. – Next 6 months and 20 days : period of comforts and pleasure. Phase 8. – last 6 months and 20 days : period of problems, so take care of health. Though different periods will give different effects but the native will always feel pinch of presence of Saturn so he may be under continuance pressure due one or the other reason. Further one can analyse himself how his different phases of Sadhe Sati period will be effecting his this period of Sadhe-Sati; by analysing his horoscope by referring the following text, but keeping in mind that Transit effects will be felt only if Natal chart promises the same. No need to worry as Saturn is Lord of Capricorn and Aquarius signs. 2. JANAM NAKASHTRA’s effects: see the Star occupied by transiting Saturn at the time starting of Sadhe –Sati of. If it is Pushya / Anuradha /Uttar Bhadarpad; No need to worry as Saturn is Lord of these Stars. 3. TARA is 3-Vipat / 5- Partyari / 7-Naiidhan – will not give good results. 4. TARA is 2-Sampat / 4-Kshem / 7-Mittar / 8-Atti Mitar – will give good results. 5. Saturn transiting over its own Sign; Sign of exaltation or its friendly Sign whose Lord is Mercury or Venus – it will give good effects than transiting enemy Signs. Saturn is Lord of ( 1st , 5th and 9th Houses) that is functional benefic – it will not give bad effects. 6. VEDHA rules of Vedha and Vipreet Vedha & Bame Vedha will modify the above results. The Vedha for transit of Saturn from Natal Moon in different houses are 1/1, 2/2, 7/6, 8/7 9/8 10/10, 11/5 and 12/11. 3/12, 4/3, 5/4, 6/9. So to do good work; do it during Vedha to Saturn as it will not do bad and vice versa. 7. If Moon is strong that is having SHADBAL greater than 1 and Transiting Saturn is also having SHADBAL greater than 1 then it will not give bad effects; but if Moon is weak then leave Saturn as it is. In case of Moon is weak then one should strengthen it by wearing Pearl etc. but Parkashtak Varga not giving points then it will not be giving good results. 10. DASHA EFFECTS : If Dasha is good then no one can do bad as Transit is Sub-Servant to Dasha Lord. 11. The effects of Sadhe –Sati will auspicious or inauspicious depends upon, whether Moon is in Saturn’s Sign or in its exalted place or in a friendly Sign. Normally Sadhe-Sati effects are not bad for Taurus, Libra, Capricorn and Aquarius Rashis. Note : At start of Sadhe-Sati; If Moon is at 2⁰ then refer Bhav Chalit chart. i) Virgo people will have 4th House Dhaia known as KANTAKA / ARDHASHTAMA Shani also. ii) Tauras people will have 8th house Dhahia known as ASHTAMA Shani. 1. Reciting Maha Mrityunjaya mantra 108 times a day is best remedy. 2. Offer Till, Chawal (Broken Rice) and desi Kjand to Aunts daily. 3. Recite Shani Satrot regularly.